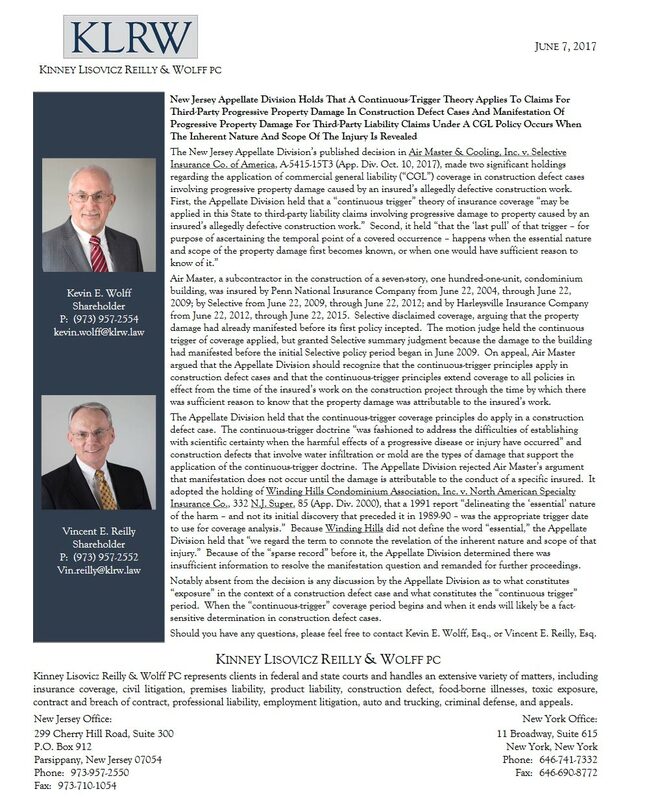 E-Alert: New Jersey Appellate Division Holds That A Continuous-Trigger Theory Applies To Claims For Third-Party Progressive Property Damage In Construction Defect Cases And That Manifestation Of Progressive Property Damage For Third-Party Liability Claims Under A CGL Policy Occurs When The Inherent Nature And Scope Of The Injury Is Revealed. E-Alert regarding Air Master & Cooling v. Selective Ins. Co., in which the New Jersey Appellate Division applied the continuous-trigger theory of coverage to a construction defect claim. The Court held that the progressive nature of damage from water infiltration and mold are types of claims that support the application of the continuous-trigger doctrine. The Court remanded for a determination of the date when manifestation began. However, the Court did not address what constitutes an “exposure” in a construction defect claim and what the “continuous trigger” period should be. Both issues will likely be fact-sensitive determinations in construction defect cases. If you have any questions about the continuous-trigger theory of coverage allocation, or other questions about insurance generally, please feel free to call Kevin Wolff or Vin Reilly. Thank you.